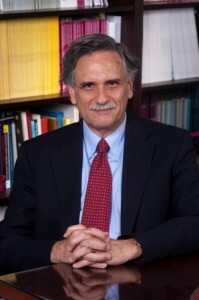 Robert Slavin, director of the Center for Research and Reform in Education at Johns Hopkins University’s School of Education, has been selected by the American Educational Research Association as one of its 67 new fellows, who are chosen in recognition of their exceptional scientific or scholarly contributions to education research or significant contributions to the field through the development of research opportunities and settings. The AERA fellows are known both nationally and internationally for their outstanding contributions to education research. Through the fellows program, the association aims to convey its commitment to excellence in research and to underscore to new scholars the importance of sustained research contributions in the field. In addition to his post at Johns Hopkins, Slavin is also director of the Institute for Effective Education at the University of York in the United Kingdom, and is the co-founder and chairman of the Success for All Foundation. He received his bachelor’s degree in psychology from Reed College in 1972, and his doctorate in social relations in 1975 from Johns Hopkins University. Slavin has authored or co-authored more than 200 articles and 20 books, including Educational Psychology: Theory into Practice (Allyn & Bacon, 1986, 1988, 1991, 1994, 1997, 2000, 2003), Cooperative Learning: Theory, Research, and Practice (Allyn & Bacon, 1990, 1995), Show Me the Evidence: Proven and Promising Programs for America’s Schools (Corwin, 1998), Effective Programs for Latino Students (Erlbaum, 2000), and One Million Children: Success for All (Corwin, 2001). He received the American Educational Research Association’s Raymond B. Cattell Early Career Award for Programmatic Research in 1986, the Palmer O. Johnson award for the best article in an AERA journal in 1988, the Charles A. Dana award in 1994, the James Bryant Conant Award from the Education Commission of the States in 1998, the Outstanding Leadership in Education Award from the Horace Mann League in 1999, and the Distinguished Services Award from the Council of Chief State School Officers in 2000. Slavin and the other fellows will be inducted on Saturday, May 1, during AERA’s 91st annual meeting in Denver, Colo. It is the association’s expectation that fellows will be visibly engaged in important AERA programs and activities and that they will serve as models and mentors to the next generation of scholars long into the future for the field. Nominated by peers, selected by the Fellows Program Committee, and approved by the AERA Council, the fellows designation is a high honor of the association. The AERA Fellows Program inducted 44 scholars in 2009 and launched with 360 Inaugural Fellows in 2008.